SAFETY CLAUSE - clause in a listing protecting the broker from having buyer and seller wait until the listing expires to make a deal, thereby avoiding the payment of commission. The clause states that if the property is sold during a specified period after the expiration of the listing (or any extension thereof) to a buyer provided during the listing period by the broker, the commission shall be paid. SALARY - compensation for services, usually paid at specified intervals, and of a set amount. SALE-LEASEBACK - sale and subsequent lease from the buyer back to the seller. Although the lease actually follows the sale, both are agreed to as part of the same transaction. SALES COMPARISON APPROACH - Also See: Market Data Approach. SALES KIT - Materials carried by a salesperson to aid in listings and sales. This is the "tool kit" of real estate, containing forms, maps, tape measure, amortization schedules, pens, paper, etc. SALES-ASSESSMENT RATIO - ratio of the assessed value of a property to its selling price, which is presumed to be market value. This shows the percentage of assessed value to market value. SALES-ASSOCIATE - One who is licensed to work in real estate under a licensed broker. SALVAGE VALUE - value of a building or portion of a building to be moved from one location for use at another site. Most often occurs in condemnation, especially for highway purposes, where large areas must be cleared. See also: Scrap Value. SAM - Also See: Shared Appreciation Mortgage. SANDWICH BEAM - See Flitch Beam. SANDWICH LEASE - lease between the primary lease and the lease to the user or party in possession. SANITARY SEWER - sewer carrying waste products, as opposed to rainwater. See also: Storm Sewer. SARA - Also See: Superfund Amendments and Reauthorization Act. SASH - Wood or metal framing around a door or window opening. SATELLITE CITIES - concept designed to stop urban sprawl to the suburbs. The satellite city leaves an undeveloped area between itself and a major city, rather than the gradual expansion of the major city. Satellite cities must be self-contained in order to be effective. SATELLITE TENANT - tenant in a shopping center that is not a major or anchor tenant. The satellite tenant depends on the major tenant or tenants to attract people to the center. SATISFACTION - Discharge of an obligation by payment of the amount due, as on a mortgage, trust deed, or contract: or payment of a debt awarded, such as satisfaction of a judgment. Also the recorded instrument stating said payment has been made. SATURATION ZONE - layer of ground which serves as a reservoir, feeding springs, wells and streams, rather than feeding vegetation or evaporating. Below the aeration zone. SAVING CLAUSE - Also See: Mortgage Saving Clause; Listing Saving Clause. SAVINGS AND LOAN ASSOCIATION - Originally an association chartered to hold savings and make real estate loans. Federally insured and regulated. Active in long term financing rather than construction loans. Recent changes in federal controls have enabled these associations to offer checking accounts, consumer loans, and other services traditionally offered by banks. SAW-TOOTH ROOF - series of shingle pitched roofs resembling the sharp edge of a saw. Usually used in factories and contains windows in each facing to allow maximum lighting. Not used in modern construction. SBA (SMALL BUSINESS ADMINISTRATION) - federal agency authorized to make loans to small businesses, including loans for land purchase and construction. SCALE - Used in maps, blueprints, and other diagrams where the drawing represents a large area. Example: One inch on a road map may equal ten miles actual distance. This ratio is the scale. SCANTLING LUMBER - Boards used in construction which are from 2" to 6" and 8" or less wide. SCOPE OF AUTHORITY - authority of an agent to bind a principal. An agent may bind a principal not only when the agent has actual authority, but also implied or apparent authority. SCORING MODEL - formula used to determine the "score" (credit worthiness) of a borrower. See also: FICO SCORE. SCRAP VALUE - value of a building or part of a building based on the value of the material alone, and not its function. Example: Plumbing for the melted down value of the metal, walls for the value of the bricks, wood, etc. See also: Salvage Value. SCRATCH COAT - term used in wet plastering, meaning the first coat applied to the lath. SCRIBING - Cutting wood precisely to fit an area. The term is used because the carpenter marks (scribes) before he makes his cut. SEA LEVEL - level of the sea, at mean tide. SEAL(S) - physical impression made on a document to attest to a signature. Most common are corporate seal and notary seal. SEARCH - Also See: Title Search. SEASONED - term referring to a land contract or mortgage, indicating that payments have been made regularly over a period of time, and that the contract or mortgage is not a new one. SEC (SECURITIES AND EXCHANGE COMMISSION) - federal agency which regulates the stock market. It gets involved in real estate when the real estate development is one which sells shares. SECOND - Also See: Degree (1). SECOND FOOT - measure of water; a flow of one cubic foot per second (almost seven and one half gallons). SECOND GROWTH - In lumbering, the trees of a forest which grow after the original stand has been cut or otherwise destroyed. SECOND HOME - home that is not the primary residence of the owner but is not a rental property. SECOND MORTGAGE - loan issued on property that is already encumbered by an existing mortgage (ie: the first mortgage). The second mortgage is subordinate to the first. SECONDARY FINANCING - loan secured by a mortgage or trust deed, which lien is junior (secondary) to another mortgage or trust deed. SECONDARY LOCATION - location not considered the best (prime) for the purpose intended. SECONDARY MORTGAGE MARKET - market wherein home loans are sold by the lender after closing to Fannie Mae, Freddie Mac or a variety of other institutional investors. SECTION - division or parcel of land on a government survey, comprising one square mile (640 acres). Thirty-six sections comprise a township. SECTION 1031 - Also See: Tax Free Exchange. SECTION 8 HOUSING - government subsidized program under which low income tenants pay a portion of their rent and the government pays the balance. Landlords must place their property in the program and agree to certain restrictions on rent amounts and increases as well as eviction procedures. SECURED LOAN - loan offering the lender more than just the borrower's promise to repay. In real estate terms, a mortgage loan. SECURED PARTY - Mortgagee, beneficiary (under a deed of trust), pledgee, or any other party having a security interest. SECURITY - Real or personal property pledged or hypothecated by a borrower, as additional protection for the lender's interest. SECURITY (INSTALLMENT) LAND CONTRACT - form once used in California which combines a land contract with a deed of trust, creating a land contract in order to defeat a first lender's "due-on sale" (alienation) clause but having the foreclosure provisions of a deed of trust. SECURITY AGREEMENT - "catch all" term used to describe many different types of debtor- creditor relationships, such as a chattel mortgage, trust receipt, inventory liens, etc. SECURITY DEPOSIT - Commonly a deposit of money by a tenant to a landlord to secure performance of a written or oral rental agreement. SECURITY INSTRUMENT - mortgage or trust deed that secures the promise to repay under the note. The instrument hypothecates real property as collateral security for repayment. SECURITY INTEREST - interest of the creditor (secured party) created by a security agreement. SEDIMENT - Any matter which settles to the bottom in a liquid. See also: Sedimentary Rock. SEDIMENTARY ROCK - One of the three major classifications of rocks. Rocks formed from sediment, such as suspension in water. Sandstones, limestones, and shales, are some examples. SEED MONEY - general term describing any initial funds used to begin a project. Usually not the major source or amount of the funds necessary to complete the project. SEISEN (SEIZIN) - Originally the completion of feudal investiture, it has come to mean possession under a legal right (usually a fee interest). SEISIN (SEIZIN) - optional speling of existing definition, which is spelled seisen (seizen). SELF HELP - Remedy allowing one party to act against another without use of court marshalls or police. Example: A landlord who evicts a tenant by simply moving the tenant's belongings out and changing the locks. Self help remedies have greatly decreased in recent years. SELF-SUPPORTING WALLS - Walls which support only their own weight. Not load-bearing. SELLER FINANCING - Also See: Purchase Money Mortgage. SELLER TAKE BACK MORTGAGE - Also See: Purchase Money Mortgage (1). SELLER'S MARKET - situation favoring a seller. In real estate, when there are more interested buyers than available properties. SELLING AGENT - real estate agent obtaining the buyer rather than listing the property. The listing and selling agent may be the same person or company. SEMI - prefix meaning partly; one half, or twice in a time period. For example: A semicircle is one half of a circle; semiannual is twice in one year. See also: Bi. SEMICIRCULAR ROOF - roof resembling an extended arch. Usually found on barns or barracks type buildings. SENIOR MORTGAGE - mortgage with higher priority than the mortgage to which it is compared. Example: A first (in time) mortgage would be senior to a second (in time) mortgage. A second mortgage senior to a third. The priority can change by subordination, making a second mortgage senior to a first, a third senior to a first or second, etc. SEPIA - master of a construction plan, from which prints are made. Called a sepia because of its brown color. SEPTIC SYSTEM - sewage system, whereby waste is drained through pipes and a tile field into a septic tank. Found in areas where city or county sewers have not yet been installed. SEPTIC TANK - underground tank into which a sanitary sewer drains from a building. The sewage is held until bacterial action changes the solids into liquids or gases, which are then released into the ground. SEQUESTRATION, WRIT OF - taking custody of one's property (real or personal) to force compliance with a court order. SERVICE - Notice given to one by delivery of a writ, subpoena, injunction, etc., by one duly authorized, giving notice to the person served of some court action or other proceeding with which he or she is involved (as defendant, witness, etc. SERVICE INDUSTRY - industry which sells the knowledge or work of its people, rather than a tangible product. Example: A real estate broker is paid for his service. The product (property) does not belong to the broker. SERVICE LINE - gas or water line which runs from the main line (usually at the street) to each property to be served. SERVICE ROAD - road running alongside a limited access highway, for use by abutting owners, and as a transition road from the highway to local streets. Also called a frontage road. SERVICE STATION - place where gasoline and other automobile products and services are sold. A gas station. SERVICING - Also See: Mortgage Servicing. SERVICING AGENT - person or entity that collects payments and performs other functions for the holder of a loan. SERVIENT TENEMENT - estate burdened with a servitude. Most commonly a parcel of land burdened by an easement. See also: Easement Appurtenant; Easement in Gross. SERVITUDE - In relation to easements, "easements" refer to the advantage of the dominant tenement, while "servitude" describes the burden of the servient tenement. SET BACK ORDINANCE - Part of a zoning ordinance. Regulates the distance from the lot line to the point where improvements may be constructed. SET-OFF - (1) construction term relating to the reduction of the thickness of a wall, or any recess or sunken panel of the wall. (2) A legal term meaning a counter demand to a claim. In condemnation, the benefits to the remaining property in a partial taking may in some jurisdictions be "set-off" against the value of the land taken. Example: part of land taken for a freeway; residue now more valuable because of freeway. Increased value is "set-off" against value of land taken. SETTLEMENT STATEMENT - statement prepared by broker, escrow, or lender, giving a complete breakdown of costs involved in a real estate sale. A separate statement is prepared for the seller and buyer. SETTLING - compaction of the soil by the weight of a newly built structure. If severe, cracks in the structure may result. SEVERALTY - estate in severalty is property held by one person alone. SEVERANCE - Partition or separation. SEVERANCE DAMAGE - Damage to the remaining property in condemnation, caused by the partial taking and subsequent construction of the road, building, or other use for which the taking took place. SEWAGE - Liquid or solid waste material of humans, animals, or industry. SEWER - pipe or other conduit, generally underground, which carries either waste materials or water from rainfall or melting snow to a point of disposal. SHAKE - To split or crack wood. SHAKE SHINGLE - Shingle composed of split wood. Used as a roofing or siding material. SHARE CROP - Crop raised by a tenant farmer who gives a portion of the crop to the landlord as rent. SHARE CROPPER - One who farms as a tenant, sharing his crop with the owner as payment of rent. SHARED APPRECIATION - gaining or retaining of equity in a property by someone other than the buyer. For example: the seller retains a 25% interest in the property. This makes the buyer responsible for only 75% of the purchase price and therefore, lowers the necessary financing by 25%. This obviously makes the property more affordable. By agreement, expenses are shared as well as any increase in value when the property is sold. SHARED APPRECIATION MORTGAGE (SAM) - financing arrangement under which the lender offers a lower interest rate in return for a percentage of the appreciation (profit) when the property is sold. SHAREHOLDER - Commonly, one who owns stock (shares) in a corporation. SHEATHING - covering over the outside studs (or rafters) of a roof. May be wallboard, plywood, etc. SHEET EROSION - loss of soil in even amounts over a given area, through the action of water. SHELTER BELT - row of trees planted so as to shelter a building from severe weather conditions. Usually found in open areas which receive heavy snowfall. SHERIFF'S DEED - Deed given at sheriff's sale in foreclosure of mortgage. The giving of said deed begins a statutory redemption period. Also given at court ordered sale, pursuant to the execution of a judgment. SHERIFF'S SALE - procedure in foreclosure that deeds the property to the sheriff and begins the redemption period. SHINGLES - Roof or wall surfacing of overlapping small sheets of wood, slate, tile, asphalt, or other waterproof material. SHOE - trim molding, covering the juncture of baseboard and floor. SHOPPING CENTER - general term, covering a number of types of clustered retail stores with common parking and ownership or management. (See specific shopping centers: Strip; Neighborhood; Community; Regional). SHORE LINE - lands alongside navigable waterways, between the high and low water marks. SHORING - (1) use of timbers to prevent cave-in during excavation by placing them against the walls of the excavation. (2) Any temporary bracing to support loads during construction. SHORT FORM DOCUMENT - document which refers either to another document not of record containing the total agreement, or incorporates by reference a document of record. SHORT FUSE MORTGAGE - slang term describing a short term note and mortgage calling for a balloon payment. (Also See: Balloon Note). SHORT SALE - sale of property which includes some forgiveness of debt by the lender under a mortgage or trust deed. The amount of debt forgiven may be considered income to the seller and taxable. SHORT TERM CAPITAL GAIN - Profit from the sale of a capital asset not held long enough to qualify as a long term capital gain. Taxed as ordinary income. SHORT TERM LEASE - general term, indicating a lease under five years in some states, under ten years in others. SHOULDER - land adjacent to the travel lanes of a road, used for vehicles having difficulty. May be paved or unpaved. SIDE DITCH - ditch running alongside a highway to carry off excess rainfall. May be paved, contain portions of large metal or clay pipe, or simply be of dirt or grass. SIDING - (1) surfacing for exterior walls, such as wood siding, aluminum, asphalt, etc. (2) A railroad track connected to a main track, and used for storage of cars, passing of trains, or other reasons to clear the main track. SIGN - advertisement placed on a property showing that the property is available for "sale", "lease", "exchange", etc. Signs have been shown by studies to be the second best advertising in terms of attracting buyers, only slightly behind classified newspaper advertising. Many local governments restrict signs as to size and location on the property. SIGNATURE - Uniform Commercial Code defines a signature as any mark made with present intention to authenticate a writing. Company policy of banks, for example, or local governmental offices, such as the county recorder, may have stricter requirements. SIGNED, SEALED, AND DELIVERED - phase indicating that everything necessary to convey has been done by the grantor. Modernly, signed and delivered are still necessary, but the only seals commonly used are by governments, corporations, and notaries. SILL - lowest member of a frame (usually wood or metal), which supports the uprights of a frame. Most commonly used to describe the lowest horizontal member of an opening, such as a door sill or window sill. SILO - Generally, a tall, cylindrical structure, used for storage of corn, etc. SIMPLE INTEREST - Interest computed on principal alone, as opposed to compound interest. SIMULTANEOUS ISSUE - simultaneous issuance by a title insurance company of policies insuring both an owner and a lender. The lender's policy is issued at a reduced rate. SINGLE - (1) One who has never been married. (2) Commonly, one who is not married, but may have been married. SINGLE FAMILY HOUSE - general term originally used to distinguish a house designed for use by one family from an apartment house. More recently, used to distinguish a house with no common area from a planned development or condominium. SINGLE PITCH ROOF - roof pitched entirely at the same angle, usually over 20 degrees. SINGLE PURPOSE PROPERTY - Also See: Special Purpose Property. SINKING FUND - fund (often invested) which will be used to replace improvements as needed. Most commonly set aside from the income of income producing property. SINKING FUND METHOD OF DEPRECIATION - process of recovering the value of an asset by setting up a sinking fund. SITE - (1) general term signifying a plot of land suitable or set aside for any specific use. (2) Land which has undergone site development and is no longer raw land. Also See: Site Development; Raw Land. SITE ANALYSIS - study of a specific parcel of land (and the surrounding area) to determine its suitability for a specific use. SITE DEVELOPMENT - All improvements made to a site before a building may be constructed, such as grading, utility installation, etc. SKELETON - frame, especially the supporting parts. SKIN - construction term, meaning the outer covering of a building. SKY LEASE - lease of air space above a parcel of land. A structure which is cantilevered or a bridge can be used in such a lease. SKYLIGHT - window in a roof or ceiling. SLAB - (1) concrete floor used as a foundation in homes without a basement. (2) Any concrete floor, even if an upper story. SLANDER OF TITLE - making of malicious, untrue statements, regarding one's title or interest in property. The statements must be made to a third party and must cause injury to the party against whom the statements are made. SLANT DRILLING - method of drilling for oil or gas from adjoining property when surface rights have not been granted. See also: Subsurface Rights; Surface Rights. SLIDING WINDOW - Also See: Traverse Window. SLIP - place between two piers or docks, where a boat is kept. SLOPE - angle of a grade as measured from a level surface. SMALL CLAIMS COURT - court having limited jurisdiction to hear cases up to a statutory limit. Cases are heard quickly, attorneys are usually not allowed unless a party to the action, and most cases are decided on fairness rather than fine legal points. SNOW FENCE - portable barrier placed along the side of a road to prevent snow from drifting onto the road. SOCIETY OF INDUSTRIAL AND OFFICE REALTORS (SIOR) - international organization which is an affiliate of the NATIONAL ASSOCIATION OF REALTORS. Its members specialize in the field of industrial and office real estate. SOFFIT - undersurface of an arch, overhang, stairway, or other such part of a building. SOFT COSTS - Also See: Indirect Construction Costs. SOFT MARKET - Also See: Buyer's Market. SOFTWOOD - Wood such as pine or fir, as distinguished from hardwood such as maple or oak. In construction, especially in flooring, softwoods and plywoods have become more popular because they cost less than the traditional hardwood flooring. SOIL - top layer of earth in which plants grow and through which water drains. SOIL BANK - federal program of conservation, under which farmers are paid for not growing crops, or growing non-commercial vegetation, in order to preserve the quality of the soil, as well as to avoid surpluses. SOIL EROSION - Also See: Erosion. SOIL MAP - map showing the different types of soil in a given area. SOIL PIPE - sanitary sewer pipe, from a building to the sewer main. SOIL PROFILE - vertical cross-section showing the different horizons (layers) of the Earth's surface. SOLAR HEATING - Heating by use and control of the energy of the sun. SOLE PLATE - plate on which the studs rest. Usually a two by four, laid horizontally at floor level. SOLE PROPRIETORSHIP - Individual ownership of a business as opposed to a partnership or corporation. SOLVENT - (1) Financially able to meet one's current debts. (2) A liquid used to dissolve a substance, usually to remove it. SOUND VALUE - synonym for depreciated costs. Used in fire insurance evaluation. Depreciation due to use up to the time of a fire. SPACE DESIGN - planning of interior space of a building to meet the needs of the user. Involves a layout and construction drawings. There are companies which specialize in space design, from construction to color coordination. Need not be architects. SPACE HEATER - Also See: Heater. SPAN - spread (distance) between load-bearing members, such as walls or girders. SPANDREL - (1) triangular space between the exterior curve of an arch and the enclosing right angle above it. (2) The triangular space beneath the string of a stair. (3) The space between the top framing of a window to the bottom framing of a window above it. SPANDREL STEP - step, such as in a circular staircase, which is triangular in shape. SPANDREL WALL - wall which fills the spandrel space of an arch. SPANISH ARCHITECTURE - Copying the houses of Spain and Mexico, a home with a courtyard, tiled roof, and usually constructed of adobe or stucco. SPEC HOUSE - Also See: Speculative Building. SPECIAL ASSESSMENT - Lien assessed against real property by a public authority to pay costs of public improvements (sidewalks, sewers, street lights, etc. ), which directly benefits the assessed property. SPECIAL BENEFITS - Benefits to the remaining property after a partial taking by eminent domain. SPECIAL FORBEARANCE - repayment plan by a lender based on an adverse change in the borrower's financial situation. It may provide for a temporary reduction or suspension of payments. A borrower may qualify if he/she has recently experienced a reduction in income or an increase in living expenses. The borrower must furnish information to the lender to show the ability to meet the requirements of the new payment plan. SPECIAL PARTNER - limited partner. See also: Limited Partnership. SPECIAL POWER - Also See: Power of Attorney (2). SPECIAL PURPOSE PROPERTY - building which, by its design, cannot be used for other than the original purpose intended, without extensive remodeling, such as a hospital or church. Also called a single purpose property. SPECIAL USE PERMIT - permit given by the appropriate government authority for a use not ordinarily permitted by zoning laws. SPECIAL WARRANTY DEED - instrument used to convey title under which the grantor accepts liability for defects in title only during the time the grantor owned the property. It is not necessary if title insurance is purchased and is not used in many states. SPECIFIC PERFORMANCE - action to compel the performance of a contract, when money damages for breach would not be satisfactory. SPECIFICATIONS - Written, detailed, drawings which show a contractor how to proceed with construction, whether in new construction or remodeling. SPECULATIVE BUILDING - building constructed for sale but without having a buyer before construction begins. SPECULATIVE LAND - Land purchased for resale rather than for use. SPECULATOR - One who buys property, not for his use, but with only the intent to sell at a profit. SPENDABLE INCOME - Net income after taxes. SPENDTHRIFT TRUST - trust created to give an income to the beneficiary while protecting the principal from the beneficiary and creditors of the beneficiary. The beneficiary may, therefore, not be able to sell or encumber the trust property. SPITE FENCE - fence built for the purpose of causing a problem for one's neighbor. May ruin the view, make access of a vehicle difficult, etc., or simply be ugly. SPLIT-LEVEL HOUSE - house with different levels, none of which is a complete story higher than another. SPLIT-RATE - Capitalization rate applied separately to land and improvements, to determine the value of each. SPOT ZONING - method of zoning which places a parcel or parcels of land under a different zoning than the surrounding area. Also used to describe zoning without a master plan. SPOUSE - One's husband or wife. SPREADER DAM - dam built in such a way as to divert water to either side, thus causing the water to spread over a given area. SPRINKLER SYSTEM - (1) When used in reference to residential property, a system of pipes under a lawn, used for watering the grass. (2) In commercial or industrial property, a system of pipes and valves in the ceiling, sensitive to ambient temperatures, which automatically sprinkles water or a chemical in case of fire. SPUR TRACK - segment of railroad track, connected at only one end to a main track, which services an industrial building or buildings. SQUARE FOOT - area contained by boundaries of 1 foot long and 1 foot wide. There are 9 square feet in 1 square yard. SQUARE FOOT COST - cost of a square foot of floor space of a building or of land. SQUARE FOOT METHOD - Determining the replacement cost of a building by finding the cost per square foot of comparable buildings and multiplying by the number of square feet of the subject property. SQUARE YARD - area contained by boundaries of 1 yard long and 1 yard wide. There are 9 square feet in 1 square yard. SQUATTER - One who lives on another's land without authority or claim of a right to possession. The land may either be private or public. SQUATTER'S RIGHTS - Commonly confused with adverse possession. A squatter has no ownership rights and cannot, under the definition of a squatter, acquire any since he claims no interest adverse to the owner. SRA - designation conferred by the Appraisal institute upon member appraisers qualified to appraise one to four residential units, including townhouses. See also: MAI; RM; SREA; SRPA. SREA - designation conferred by the Appraisal Institute upon members qualified in real estate appraisal and analysis, as well as giving investment advice. See also: MAI; RM; SRA; SRPA. SRPA - designation conferred by the Appraisal Institute upon member appraisers who are qualified to appraise all types of real estate. See also: MAI; RM; SRA; SREA. STAIN - oil paint used to coat wood, which has little thickness or gloss. STAND CRUISE - Also See: Cruise. STANDARD COVERAGE POLICY - title insurance policy used in several states, not having as broad a coverage as the nationally recognized American Land Title Association (A.L.T.A.) policies. STANDARD DEPTH - Depth of a lot considered to be the normal depth for appraisal purposes. Traditionally, one hundred feet for a residential lot. STANDARD PARALLELS - East-West survey lines, establishing township boundaries at twenty- four mile intervals, and correcting inaccuracies in the government survey, due to the curvature of the Earth. STANDBY COMMITMENT - commitment to issue a loan, usually for a term of one to five years, after completion of construction, in the event a permanent loan cannot be obtained. The standby loan is usually at a higher interest rate than a permanent loan, and a standby fee is charged. STANDING LOAN - loan requiring interest payments only, the principal being paid in full at maturity. STANDING TIMBER - Timber still uncut. Trees. START CARD - file card used as a record of the opening of an escrow. It lists the date the escrow opened, escrow number, name of escrow officer, names of parties to the escrow, lender, title company, legal description of property, consideration, and type of transaction (sale, loan, etc.). START RATE - beginning interest rate on an adjustable rate loan. It may be much lower than the actual interest rate and only last for a few months. Also called the Teaser Rate. STARTER - copy of the last policy issued by a title insurer, which describes the condition of title to land upon which a new policy is to be written. In some states this is furnished to an attorney for his opinion as to the condition of title, and is called a back title letter or back title certificate. STARTER HOME - 1. The first home purchased by that buyer. 2. A discrete description of a home that is small and not in good condition or without desirable amenities. STARTS - Units on which construction has begun. STATE ROAD - highway under the control of the state, which may eliminate it if desired, as opposed to a federal (interstate) highway. STATEMENT OF IDENTITY - Also See: Statement of Information. STATEMENT OF INFORMATION - confidential form filled out by buyer and seller to help a title company determine if any liens are recorded against either. Very helpful when people with common names are involved. Also called a statement of identity. STATUTE OF FRAUDS - State laws, requiring certain contracts to be in writing. All contracts for the sale of real property must be in writing. Leases (personal property) for more than one year must be in writing. STATUTE OF LIMITATIONS - law which limits the bringing of a court action (civil or criminal) to within a specified period of time. STATUTORY DEDICATION - giving of private land for public use under a procedure dictated by statute. STATUTORY LIEN - involuntary lien (created by law rather than by contract). Includes tax liens, mechanic's liens, etc. STATUTORY NOTICE - Notice given by legislative enactment (laws or statutes). STATUTORY REDEMPTION PERIOD - Also See: Redemption Period. STATUTORY RESERVE - Reserves of funds which must be kept by banks, savings and loans, insurance companies, and like businesses, to insure their ability to meet demands for funds in their course of business. STEP-UP LEASE (GRADED LEASE) - lease calling for set increases in rent at set intervals. STICK BUILT CONSTRUCTION - traditional and most expensive method of building. The structure is built on site. See also: Manufactured Home. STICK BUILT HOME - structure built entirely on the site, as opposed to one that is built in a factory and assembled at the site (manufactured). STIRPES - Also See: Per Stirpes. STOCK COOPERATIVE - type of common interest development under which a corporation owns the development, and shares of stock and the exclusive right to occupy are issued as a method of conveying ownership of the units. STOCK COOPERATIVE MORTGAGE - mortgage covering all of a cooperative apartment building or an individual unit of such. Also See: Cooperative apartment. STORM SASH (STORM WINDOW) - extra window on the outside of an existing window, as additional protection against cold weather. STORM SEWER - sewer carrying off rainwater. May also carry off industrial waste, such as chemicals, although many areas now forbid this. STRAIGHT LEASE (FLAT LEASE) - lease calling for the same amount of rent to be paid periodically (usually monthly) for the entire term of the lease. STRAIGHT LINE DEPRECIATION - method of replacing the capital investment of income property, by reducing the value of the property by a set amount annually from the income, over the economic life of the property. STRAIGHT NOTE - promise to repay a loan, signed by the debtor and containing the date executed, amount owing and to whom, date due (or on demand), rate of interest and how it is payable. A straight note is not amortized. STRAIGHT-TERM MORTGAGE - mortgage calling for principal to be paid in a lump sum at maturity. STRAW MAN - One who acts for another, not openly, but as a principal to hide the identity of the party for whom acting. STREAM - Any water course, including a river, brook, channel, etc. STREET - general term which includes any urban road, usually paved. STREET ADDRESS - number and name of the street (road, drive, avenue, etc. ), the town or city, the state and zip code. Not acceptable on a deed, for example, for purposes of recording. The more technical description by lot and tract, sectional property description or metes and bounds is required. STREET IMPROVEMENT BONDS - Interest bearing bonds, issued by a local government, to secure assessments for street improvements. The owners of the property assessed may pay in a lump sum or pay installments on the bonds, including interest. STREET IMPROVEMENTS - Improvements connected with a street, such as paving, sidewalks, curbs, etc. STRESS - pressure of weight against a structural member. Materials are tested to determine the amount of stress they may hold before bending or breaking. STRICT FORECLOSURE - Also See: Judicial Foreclosure. STRICT LIABILITY - Liability which does not require a finding of fault (negligence). Classic examples for land use are dynamiting and keeping wild animals. Modernly used in environmental contamination cases. STRINGPIECE - heavy timber used as a horizontal support for cross members. STRINGS - sides which support stair treads. STRIP CENTER - Any shopping area, generally with common parking, comprised of a row of stores. Usually does not contain major department stores or grocery chain stores. STRUCTURAL LUMBER - Lumber used for its strength, 2" X 4" or greater. STRUCTURE - Any man-made building or edifice. STRUT - construction member, usually wood, placed between other members to support a load vertically, or pressure horizontally. STUCCO - wet plaster finish, specifically designed for exterior use, very poplar as an outside wall surface in warm, dry areas. STUDS (STUDDING) - Vertical supports (wood or metal) in walls and partitions. SUBBASE - base under a slab or roadway, usually of crushed rock, sand, and gravel. SUBCHAPTER S CORPORATION - entity receiving the protection of the corporate form, but being taxed as an individual. SUBCONTRACTOR - One who works under a general contractor (builder), such as an electrical contractor, cement contractor, etc. SUBDIVIDER - Also See: Developer. SUBDIVISION - Commonly, a division of a single parcel of land into smaller parcels (lots) by filing a map describing the division, and obtaining approval by a governmental commission (city or county). The exception is a condominium, which is sometimes called a "one lot subdivision". SUBDIVISION MAP - map submitted by a subdivider to the proper governmental body for approval in order to establish a subdivision. When the map is approved and recorded, it becomes the basis for the legal description of the subdivision. SUBFLOOR - Underflooring laid on joists, over which finish flooring is laid. SUBJACENT SUPPORT - right of an owner to have the surface of his land supported by the land under it, so that it does not collapse. Work on adjoining land (mining, excavating, etc.) could cause this problem. See also: Lateral Support. SUBJECT TO CLAUSE - clause in a deed, stating that the grantee takes title "subject to" an existing mortgage. The original mortgagor is alone responsible for any deficiency, should there be foreclosure of the mortgage. Differs from an "assumption" clause, whereby the grantee "assumes" and agrees to pay the existing mortgage. SUBLEASE - lease, under which the lessor is the lessee of a prior lease of the same property. 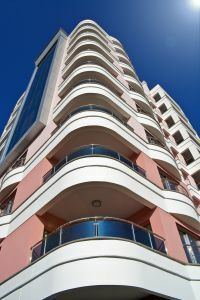 The sublease may be different in terms from the original lease but cannot contain a greater interest. Example: A leases to B for 5 years. B may sublease to C for 3 years, but not for 6 years. See also: Assignment of Lease. SUBLESSEE - lessee under a sublease. SUBLESSOR - lessor under a sublease. SUBLET - To create a lease under which the lessee of a prior lease is the lessor. SUBORDINATE - To make subject or junior to. SUBORDINATE FINANCING - Any loan below (subordinate to) a first mortgage. SUBORDINATION AGREEMENT - agreement by which an encumbrance is made subject (junior) to a junior encumbrance. For example: A loan on vacant land is made subject to a subsequent construction loan. SUBPOENA - legal process (writ) used to require the appearance of a person or documents into court. SUBROGATION - substitution of one person for another, so that the former may exercise certain rights or claims of the latter. Used primarily when a surety relationship exists, as in insurance. SUBSCRIBE - To write under or below. To sign at the end of a document. SUBSIDENCE - Settling of the ground surface from loss of support in the ground beneath. May be caused by mining, lowering of the water table, etc. SUBSIDIZED SECOND MORTGAGE - subordinate loan issued to a select group such as firefighters, police, teachers or low income borrowers. It may be issued by a state or local government agency or by a nonprofit organization. The mortgage has a low interest rate and may even be forgiven under certain circumstances. Also called a Community Second Mortgage. SUBSIDY - grant to aid in any work or enterprise, or to reduce the cost of a product. The federal government, for example, aids certain low income families by subsidizing rental payments. SUBSTITUTION - principle in appraisal holding that a buyer will not pay more for property than the price of available similar (substitute) property. SUBSTITUTION OF TRUSTEE - document which is recorded to change the trustee under a deed of trust. A simple procedure in some states;more regulated in others. SUBSTRUCTURE - That portion of a building below ground or grade; which is the foundation for the superstructure. SUBSURFACE EASEMENT - Also See: Subsurface Rights. SUBSURFACE RIGHTS - rights, whether by fee or easement, to oil, gas, or minerals, below a certain depth beneath the surface of land. The right of surface entry may or may not be excluded, and is important to the value of the surface land for improvement purposes. See also: Slant Drilling. SUBURBAN - area around a city. Usually residential with small businesses, although modernly an attraction for large industrial and commercial complexes. SUCCESSION - passing of real property by will or inheritance, rather than by grant deed or any other form of purchase. SUITE - group of rooms in a hotel, rented as one unit. Usually contains a minimum of one bedroom, a sitting room, and bathroom. SUMP - pit or similar storage area in a basement for collecting drained liquid waste. SUMP PUMP - pump used to force the collected liquids from a sump. SUPERFUND - federal program created by the Comprehensive Environmental Response, Compensation, and Liabilities Act of 1980 (CERCLA) and amended by the Superfund Amendments and Reauthorization Act of 1986. The program carries out the Environmental Protection Agency's purpose to identify and carry out or supervise the cleanup of contaminated sites. See also: Hazard Ranking System; National Priorities List. SUPERFUND AMENDMENTS AND REAUTHORIZATION ACT - 1986 federal legislation which reauthorized the Comprehensive Environmental Response, Compensation, and Liability Act of 1980 (CERCLA). Additions in the 1986 act include the Innocent Landowners Defense. SUPERSTRUCTURE - That portion of a building above ground which is supported by the substructure. SUPPLEMENTAL ABSTRACT - abstract covering a search of the public records between given dates. SUPPLY AND DEMAND - economic theory that when supply exceeds demand, prices fall, and when demand exceeds supply, prices rise. SUPPORT - Also See: Lateral Support; Subjacent Support. SURETY - One who voluntarily binds himself to be obligated for the debt or obligation of another. For example: A co-maker of a note; an insurance carrier. Surety differs from guarantor, although commonly (and mistakenly) used interchangeably. SURFACE RIGHTS - rights (easements) to use the surface of land, including the right to drill or mine through the surface when subsurface rights are involved. SURFACE WATER - Water caused by precipitation, which spreads over land and stays on the surface (a swamp) or percolates through the ground. SURRENDER - giving up of an estate, such as a lease. A contractual agreement, having the consent of both parties, such as lessor and lessee, as opposed to abandonment. SURVEY - map prepared by an engineer or surveyor charting a particular piece of real estate. SURVIVORSHIP - Gaining an interest in property by outliving (surviving) another who had the interest. SWALE - low-lying area in otherwise level ground. SWAMP - Soft, wet land, usually containing heavy vegetation and under water much of the time. SWEAT EQUITY - substitution of a borrower's (buyer's) work to improve the property for the usual cash down payment. SWING LOAN - interim loan made so that the borrower may purchase property during a pending sale of borrower's property. The proceeds from the sale are then used to pay off the swing loan. SYNAGOGUE - Meaning "to bring together", it is a building where Jews assemble to worship. SYNDICATE - association of individuals, formed for the purpose of carrying on some particular business venture in which the members are mutually interested.